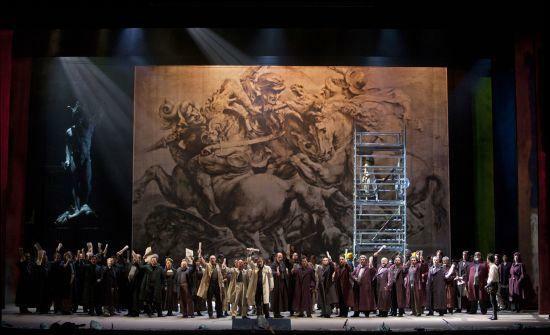 The Teatro dell’Opera di Roma’s new production of La battaglia di Legnano is part of the nationwide celebration of the 150th anniversary of the Republic’s founding. The choice is apt; this obscure opera is one of Verdi’s less covert Risorgimento works and features many rousing paens to Italia. (One post-unification production even retitled it The Defeat of Austria.) The production pushes this angle, so it’s almost irresistible to make this underwhelming, underattended, indifferently received premiere an allegory for the (poor) State of Opera in Italy Today. I don’t know if that’s appropriate because Italian opera politics isn’t something I know much about. After passive aggressively suggesting that, let’s talk about this opera. Dramatically speaking, the titular battle disappointingly occurs offstage. The onstage action involves a love triangle but mostly consists of episodes of saber-rattling and note-passing more confusing than the Roman bus system. Plus the periodic chorus in praise of the Patria, naturally. In war-torn Medieval Milan (Barbarossa is invading), Lida married Rolando, but always loved Arrigo. Who she thought was dead, but of course he wasn’t. Drama ensues. 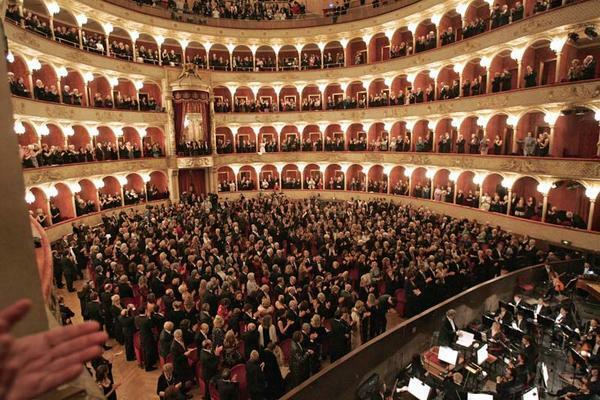 Singing comes before staging in most Italian opera houses, and that was the case here. The production is primarily concerned with getting everyone lined up downstage so they could sing nice and loud. Conceptually it is a mess. Director Gabriele Lavia left the production acrimoniously three months before the premiere, his vision apparently too costly and complicated for the company management (click on the Battaglia di Legnano link in the right column in the link above for a PDF with an article concerning this, in Italian). What last-minute replacement Ruggero Cappuccio has pieced together isn’t that great. In what’s left over of Lavia’s concept (judging by what he says in the article linked to above), he pays studious tribute to the truism that an opera staging should reflect the original setting, the time of the opera’s composition, and the present day. 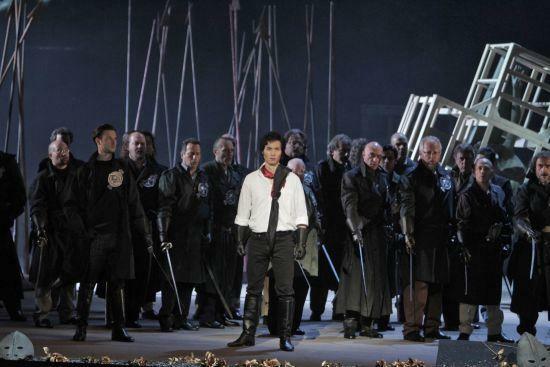 The first is shown in the action itself and 19th-century paintings representing Medieval subjects which appear as a backdrop, the second in the costuming of the principals (tenor warrior hero Arrigo rather obviously sports a red Garibaldi neckerchief), and the latter in the modern dress of the chorus. Added to this is a silent lady in white who dabs at the background paintings, apparently showing the representation of Italy, or something. 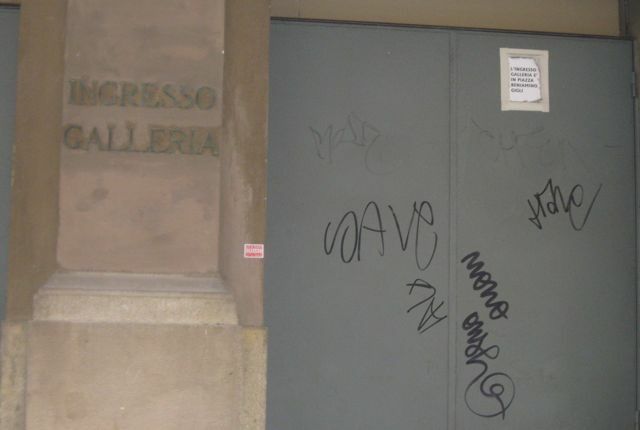 There are also some antiquities in crates, further showing the construction of Italy’s identity? Unfortunately none of this helps tell the story, the sets give little help to figure out what is happening and the non-existent blocking and characterization don’t assist either. It all ends up a bit screwy. I was wondering why the chorus was dressed in three different colors until they obediently organized themselves to reveal that their red, white, and green made them look like a massed Italian flag. OK.
It’s a shame that the staging didn’t make a better case for the opera, because the singers were pretty good. Tenor Yonghoon Lee has been getting a lot of buzz recently, and after missing his Wien Cavaradossis in April I was glad to hear him here. His voice is a dark, ringing spinto that’s powerful, glamorous, and even, a remarkable instrument with a ton of potential. But as a performer I have to keep him in the “potential” category for now due to a distinct lack of musical sophistication. I know this isn’t a style crying for subtlety, but singing with only one tone color and little differentiation of phrasing and dynamics becomes boring no matter how great the voice. I can’t really judge his acting based on this production, but he is quite good-looking. Tatiana Serjan as Lida has a loud and steely and Russian voice that isn’t that beautiful, and she got tangled up in the cadenzas and coloratura at times. But she’s got that elusive thing known as temperament, and was fascinatingly intense to watch. Despite the blunt nature of her instrument she varied her singing well. She is what Maria Guleghina should be, with a better technique, no wobbles and without the wildly inappropriate repertoire. I would love to see Serjan go to town in an opera and production that gives her a little more space; I think she would bring it. The only Italian among the major roles (a fact I’m sure escaped no one) was Luca Salsi as Rolando, who was solid and reliable and effective if something less than amazing. Dmitriy Beloselskiy made a strong cameo as Barbarossa (yeah, it’s that kind of opera). The chorus subscribes to the same school of Hearty Singing as the Staatsoper and sounded excellent, likewise the orchestra made this music sound less oom-pah-pah dull than it could. Pinchas Steinberg’s reading was clear, effective, not the high polish of Muti but a cut above average tub-thumping early Verdi. The house was, at most, 75% full and the performance was received indifferently, with many not even staying to applaud or boo the production team (there was a decent amount of booing for them, yet), despite enthusiastic reception for Lee, Steinberg, and the orchestra. Not very festive for a celebration of Italy. Or maybe I’m just too used to the long ovations of Austria and Germany and having an ORF camera pointed in my direction at every first night. Further performances are on 26, 28, 29, 31 May. May 28 features an alternate cast. This production will be seen later at the Liceu in Barcelona. 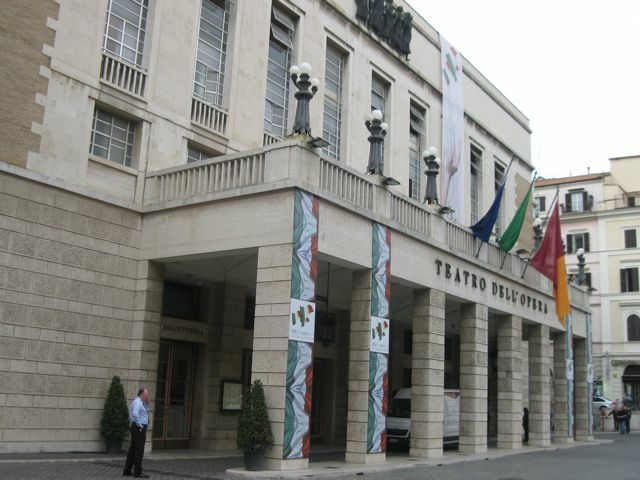 About the Teatro dell’Opera di Roma: It is important to note that the opera house’s website does not sell tickets in the cheaper price categories. It might look like the cheap tickets are sold out, but they may not be! If you want to buy a cheap top-level galleria seat (it is a small house and I could see just fine, even from the side, for the very reasonable price of 23 Euros), you can do so from the box office in person. I got mine there on the day of the performance, for a premiere, but this might not always be possible. You can also buy a galleria ticket for extra cost through a third party website such as this one. Last-minute discounts aren’t that good and there is no standing room. Dress is somewhat more casual than in Austria or Germany, but also more stylish. In a city of many beautiful buildings, the opera house doesn’t even bother to try to compete. It is also located in a dull district near the train station. 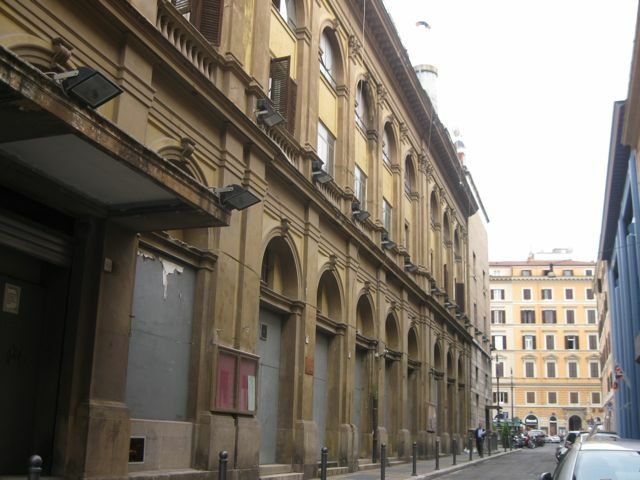 Production photos copyright Teatro dell’Opera Roma. I love these on-location reports. I hope this is the start of your travel season! How foolish to pretend that lee's musical sophistication is in question. There is no other italianate spinto Tenor today with such a command of verdian style and ability to sing house filling pp alternating with thrilling passionate expressive phrasing. Excuse my foolishness for thinking that singing an entire opera in forte is boring. This was his role debut, maybe I should have cut him some slack there, but it was really monochromatic singing.